Pretty bad, to be honest. Trading conditions on March 14 were really terrible, so both Variants took additional hits and were forced to give back more of their gains. Anyhow, here’s what we’ll be covering in today’s update. Note: Trades # 46, 47, and 48 were executed on March 15 and are therefore excluded from the table. They’ll appear in tomorrow’s update. Note: Trades # 46, 47, and 48 were executed on March 14 and are therefore excluded from the table. They’ll appear in tomorrow’s update. 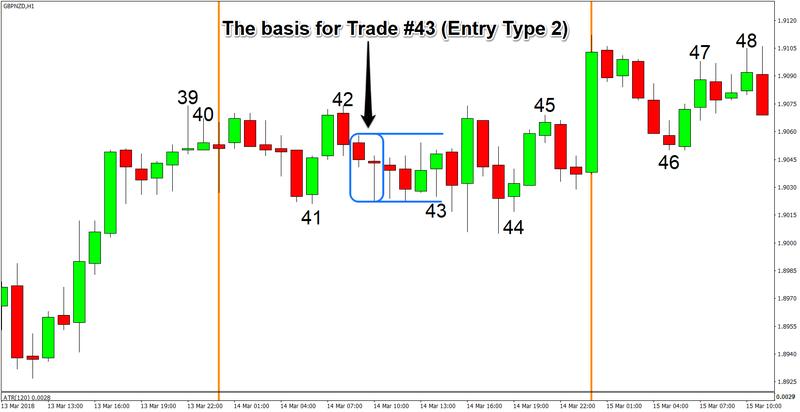 The day’s range on March 14 was a pitiful 69 pips, so trading conditions were really tight. And to give y’all some context, GBP/NZD’s average daily range is around 225 pips, based on historical data from 2007-2017. And to make matters worse, intraday price action was choppy and GBP/NZD was practically trading sideways. In other words, trading conditions on March 14 were really terrible. 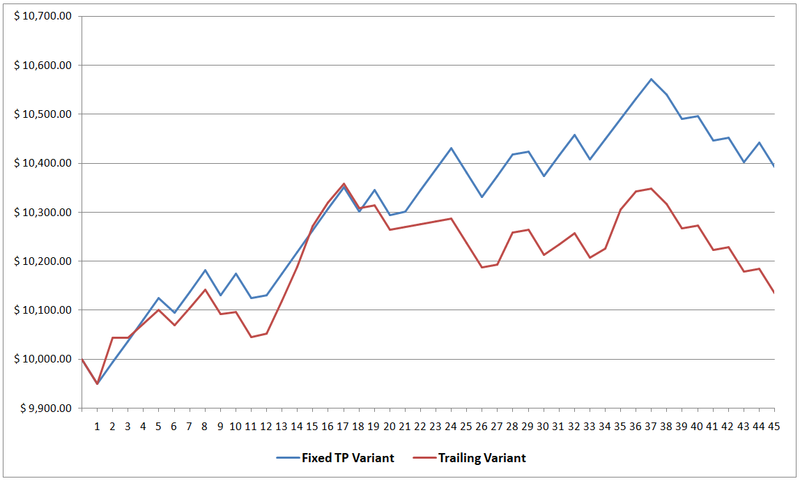 And that’s why the Fixed TP Variant was forced to return even more gains, so the Fixed TP Variant is now only up by 3.92% for the month (+4.97% yesterday). The Fixed TP Variant was able to capture a full win at least (trade # 44), which eased some of the pain. However, a trend didn’t form. Worse, the pair pulled back, forcing the Trailing Variant to punch out at SW.
And since the Trailing Variant just couldn’t get a break, it’s total returns for the month dwindled to just 1.35% (+2.73% yesterday). Whoop-de-doo! It’s almost February all over again. Anyhow, that’s all for today. By the way, reader sanchum has decided to create an EA based on the rules. It’s still a work-in-progress and a lot of things need to be worked out, so DON’T TRADE IT LIVE. But if you’re interested in testing the EA and speeding it’s progress, you can download it below and then message sanchum directly or post in the comments section below to discuss how to improve it. 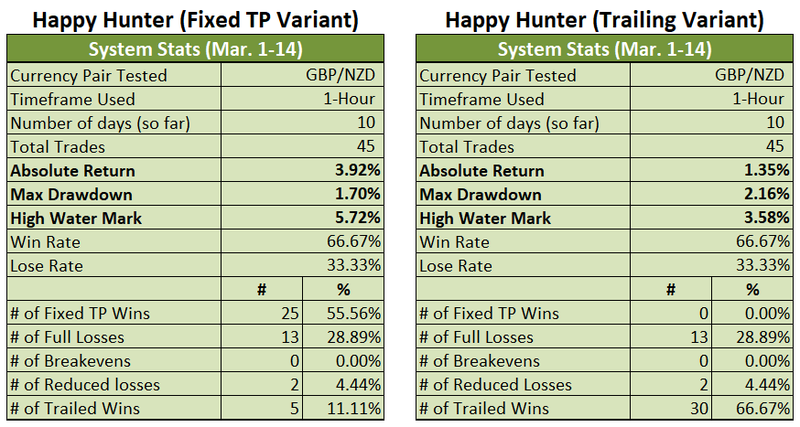 I’m sure sanchum and everybody else who’s interested in the Happy Hunter Trading system will appreciate it.